Originally compiled by Jesse Koski. Subsequent revisions by Ken Humphreys. P&WRR expresses appreciation to the many contributors of reporting mark information who have assisted in keeping this listing as current as possible. In particular we wish express our deep appreciation to IHS Maritime & Trade, publishers of The Official Railway Equipment Register (ORER). The link to IHS takes you to their railroad related publications. Without the assistance of IHS and ORER it would be literally impossible for us keep this listing of AAR reporting marks current. If you have any comments, corrections or additions, please e-mail the P&WRR Webmaster. This file contains AAR assigned reporting marks that have been compiled from many sources such as the Official Railway Equipment Register (ORER). Many common railroad abbreviations are also included. The list includes all active AAR reporting marks listed in the January 2017 issue of ORER plus many others which have been reported by viewers of this web page. Thousands of historical marks which are no longer in use are included in these listings. Note that some companies do not include their marks in any generally available published listings. Thus, such marks which are currently in use are not necessarily reflected in this list unless we have learned of the existence of the mark and have been able to identify the name of the owner of the mark. It should also be noted that many active marks are those of orphan railroads and companies which are no longer in business. Quite often the successor company continues to use the orphan marks and does not have the registration of the mark updated. In those cases we have attempted to show the name of the orphan railroad or company as well as the current user of the mark. Also included in the abbreviations are 199 railroads and affiliated companies which became a part of the Southern Railway System. Railroads acquired by Southern some time after 1894 when the railroad was formed by merger of several railroads are noted in the listings. The Southern Railway System later merged with the Norfolk & Western Railway to become the Norfolk Southern Corporation in 1982. Note that most of the companies which were incorporated into the Southern Railway existed before the advent of AAR reporting marks. They are therefore listed by abbreviations, not by reporting marks. http://www.bic-code.org/official-register-containers-bic-code.html. The registry of marks is now maintained by the Bureau International des Containers et du Transport Intermodal rather than by AAR. * (Asterisk) or + (plus) denotes duplicated or reassigned reporting marks among the various sources we have come across over the years. This is often due to the fact that the reporting mark had been retired long ago and reassigned, or the company was sold, bought out, merged and/or changed names. Some marks are also registered to equipment leasing companies which have leased the equipment to more than one customer, each of which used the mark. In some cases a mark may be shown as the mark of the leasing company and also as the mark of the lessee company. If both the lessee company and the equipment leasing company are known, both names appear after the mark and are separated by a /. Many of the duplicated reporting marks are also due to the many railroad mergers and purchases over the years. Since this is a compilation of many reporting marks lists, we have made no attempt to track down the history of the many companies in this list. In most cases, but not all, duplicated marks are listed with the oldest mark first. If the current holder of a duplicated or reassigned mark is known, the entry is preceded by +. If the AAR assigned reporting mark differs from the AAR uniform alpha code, the uniform alpha code is shown in parenthesis prior to the name of the reporting user. A limited number of commonly used abbreviations for railroad names and terms is also included in this listing. Examples are MOW (maintenance of way) and UNK (railroad unknown). Reporting marks, along with the car serial number, are used by shippers and railroads to identify specific pieces of rolling stock. All organizations with cars in interchange service are assigned reporting marks by the AAR. Some reporting marks may still be registered even though the organizations no longer have cars in interchange service or may still be awaiting delivery of ordered cars. 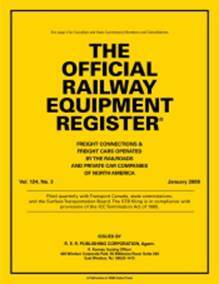 The uniform ALPHA code is assigned by the AAR to all organizations that may be involved in handling rail equipment. The ALPHA code usually, but NOT always, is the same as the reporting mark and, in the case of an organization that has no current or planned interchange equipment, is NOT to be considered as a reporting mark until so assigned. The ALPHA code is used by shippers and railroads to identify car-handling organizations for purpose of routing, billing, division of charges, etc. PLEASE NOTE that for historical research purposes this list contains references to many companies that are no longer be in existence. NOTE ALSO that reporting mark changes and additions occur frequently. Company names also change due to mergers and other reasons. If any errors, changes or omissions are noted in these listings, please bring them to the attention of the P&WRR Webmaster so that we may keep these listings as current and comprehensive as possible.